We could talk about Wolkys all day long, so if you have a question about our products or process, we’re more than happy to help. Here are the answers to some the most common inquiries, and if you still can’t find what you’re looking for, send us an email. “Wolky” means “cloud” in Dutch. Put on a pair of Wolky and you’ll know what we are all about, that is, comfortable, quality footwear made for feet. With a meticulously designed last, custom designed soles, anatomically shaped footbed, and full grain leathers, Wolky places a great deal of attention to the details so your feet can walk in comfort. Where can I buy Wolkys? There are authorized Wolky retailers all across the nation, from sea to shining sea. How convenient. Use our store locator to find one near you. Can I buy directly from Wolky? Wolky is a wholesale distributor, so we sell our shoes through a network of authorized retailers around the world. This gives our customers in-person access to expert fitters and customer service reps, which we believe makes a huge difference in your experience with our product.We sell from our website that joins forces with our network of Wolky authorized retailers. If we do not have it available, then perhaps our network of authorized retailers will have it in their inventory. What models have removable footbeds? Where can I purchase a replacement footbed? It’s easy. Just visit your local Wolky retailer for the model you own or order through our online shop. Can my Wolkys be resoled? For top performance, we recommend replacing your Wolkys when the sole is worn enough to be replaced. Do Wolkys have a lifetime guarantee? Shoes in general are not designed to last a lifetime. Your Wolkys can certainly last through several years and seasons of regular wear. If you believe there is a defect with the materials or workmanship, please contact the retailer about returning or replacing your shoes within a year’s time of purchase or contact us at info@wolkyusa.com and we can contact Wolky authorized dealer regarding your issue. Please provide a receipt showing date and proof of purchase through an authorized Wolky retailer. Does Wolky have a warranty? Every pair of Wolkys comes with a one-year manufacturer’s warranty free from defects in workmanship and materials. Normal wear and tear, or damage resulting from abuse, negligence, improper repairs, inadequate fit, alterations, modifications, or misuse are not included. If you feel that your purchase is defective, please contact your Wolky authorized dealer. They can immediately assist you on your concern that may not necessarily be visually apparent. We use factories around the world for its specialty shoe-making techniques and we exclusively own and operate the plant in Mexico. Regardless of the location and where we assemble, you can always trust that Wolky sources quality materials to ensure the level of comfort our enthusiasts are familiar with. Who do I contact to return my Wolkys? All refunds or exchanges must be made through the original place of purchase following the terms and conditions set forth by the retailer, online retailers, Wolky online store. Who can I contact if I have a problem with a Wolky product I purchase through an unauthorized dealer? We would recommend that you contact the seller. Wolky cannot assist you on purchases made through an unauthorized dealer or third-party auction site. For a list of authorized Wolky dealers, please go to our Store Locater page. Who can I contact if I have a problem with my Wolky purchase through an authorized retailer? If you believe there is a defect with the materials or craftsmanship, please contact the dealer where you purchased your footwear for assistance. How do I determine my European size? The size conversion from metric to U.S. varies slightly by collection, so the conversion is not exact. 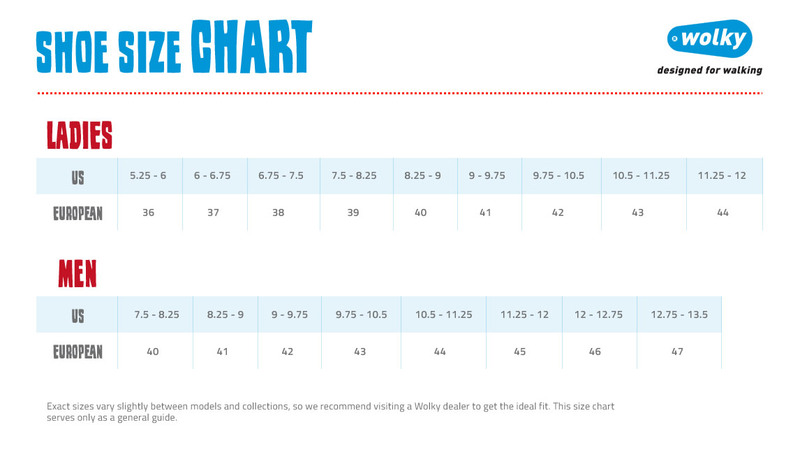 Our size chart serves as a general guide, but we recommend that you visit an authorized dealer who can help you find the perfect fit for your unique feet. Can I put custom orthotics in my Wolkys? Many of our models have removable foot beds or inlays, that can be replaced by your own custom-made orthotic from a pedorthist or podiatrist. Orthotics varies in size, shape and thickness, so they may or may not achieve an optimal fit in your Wolkys. Keep in mind our foot bed or inserts have contours for foot support and are designed to provide exceptional support. ou may find that they alone provide exactly what your feet need. Does Wolky have wide or narrow footwear? Majority of Wolky products are designed on a medium last. That said, our shoes offer excellent adjustable features to accommodate changes in your feet throughout the day. How should I care for my Wolkys? Check out our Shoe Care section for specific Wolky care tips and tricks. The color from my Wolkys is rubbing off on my feet. What should I do? Wolky footwear is made with genuine premium leathers. With premium leathers, the dye is absorbed through the entire leather. This is better and more costly grade of leather and is apparent by the softness and the suppleness on your feet. Bleeding can occur even in the best tanned leathers. This is not a defect. If your feet are stained from the dyes, you can easily remove this with a mixture of warm water and bath salts. For personal assistance on how to treat the leathers with non-silicone based water resistant spray, please contact your Wolky authorized retailer if you need personal assistance.